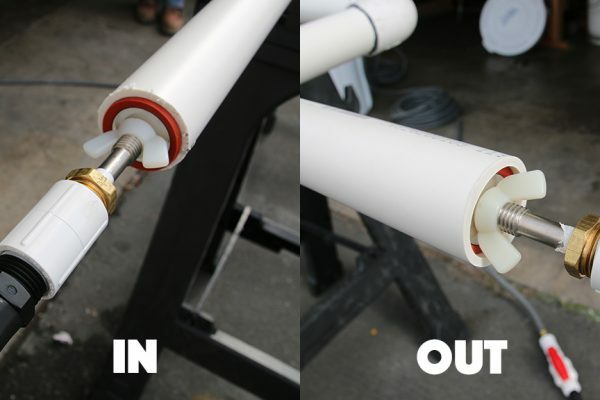 NEVER RUN PIPEFUZE THROUGH A FILTRATION SYSTEM OR ANY OTHER TYPE SYSTEM OR EQUIPMENT WHERE PASSAGE WAYS REDUCE TO LESS THAN 1/4 INCH. IF WORKING ON SPA JET LINES WITH A VENTURI SYSTEM, JET VENTURI NOZZLES MUST BE REMOVED BEFORE THE APPLICATION. DO NOT EVER STAND IN FRONT OF A PLUG WHILE UNDER PRESSURE, MAY CAUSE SEVERE DAMAGE AND/OR BODILY HARM. ALWAYS RELEASE PRESSURE BEFORE REMOVING ANY RIGS. Perform pressure test on line about to be injected. Bring pressure up to 10-15 lbs. (For a smaller diameter pipe, the pressure should be on the smaller end of pressure, for a larger diameter pipe, the pressure should be at the upper end). If you notice more than a 5lb drop in 30 seconds, chances are that the break is too large for PipeFuze to handle and there is a good chance the deck would need to be cut open. Determine the inflow and outflow of the pipe to be repaired. ***NOTE: If the line being repaired has multiple inlets or outlets, it may be necessary to either shut them (if they have valves) or plug them with a plug. Insert the Pipe Injector into the inflow side of line. Insert the return rig at the predetermined outflow side of the line being repaired. Set mixing bin on a flat surface anywhere centered between the injection rig and return rig and fill halfway with water. Set the injector pump into the mixing bin and connect the female side of the hose (supplied) to the pump. Connect the male side of the same hose to the injection rig. Connect the female side of the other hose (supplied) to the return rig and connect the male end of the same hose in the mixing tank. Check to make sure there are no kinks in any of the hoses. After this is done, plug in the injector pump and wait until the line is primed completely and all air is purged. SHAKE PART A VIGOROUSLY FOR NO LESS THAN 1 MINUTE: Then pour entire contents of Part A into bin. Reinstall injector plug back into line firmly and plug the injector pump back in. Let the system run for approximately 2 hours, but keep an eye on the bin to see if there is major water loss. If there is, then the leak clearly isn’t sealed. Add another bottle of “Part A” and refill the bin halfway and repeat the process above while watching the level. SHAKE PART B VIGOROUSLY FOR NO LESS THAN 1 MINUTE: and pour the entire contents of Part B (Catalyst Hardener) into the mixing bin and allow the pump to run continuously for approximately 2 hours. For best results, if possible, run part B for a maximum of 3 hours. Disconnect the injection rig and the return rig and clean with water. Clean out mixing bin and rinse pump with water as well. At this point, the repaired line can either be pressure tested or returned to service.